Chlamydia is an obligate intracellular bacterial pathogen that replicates solely within a membrane-bound vacuole termed an inclusion. Chlamydia seems to perturb multiple cellular processes of the host, such as, rearrangement of the membrane trafficking system for its intracellular multiplication, and inhibition of host cell apoptosis for persistent infection. In an attempt to clarify host factor involvement in apoptosis regulation, we found that inhibition of Caspase-9 restricted, while Apaf-1 promoted, Chlamydia pneumoniae infection in HEp-2, HeLa, and mouse epithelial fibroblast (MEF) cells. These opposition contributions to the chlamydial infection were confirmed using caspase-9 −/− and apaf-1 −/− MEFs. Similar phenomena also appeared in the case of infection with Chlamydia trachomatis. Interestingly, caspase-9 in apaf-1 −/− MEFs was activated by chlamydial infection but during the infection caspase-3 was not activated. That is, caspase-9 was activated without support for multiplication and activation by Apaf-1, and the activated caspase-9 may be physically disconnected from the caspase cascade. This may be partially explained by the observation of caspase-9 accumulation within chlamydial inclusions. The sequestration of caspase-9 by chlamydia seems to result in apoptosis repression, which is crucial for the chlamydial development cycle. Because Apaf-1 shares domains with intracellular innate immune receptor NOD1, it may play a key role in the strategy to regulate chlamydial infection. Mutsunori Shirai and Yoshinao Azuma share senior co-authorship. 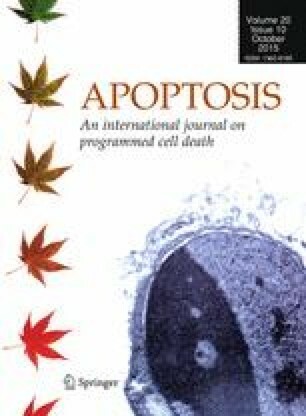 Apoptosis or programmed cell death is an active process of cellular suicide triggered by a variety of stresses and physiological stimuli for tissue development and homeostasis of organisms . The morphological and biochemical features of apoptosis are caused by activation of caspase cascades in both of the major pathways, the death receptor-mediated extrinsic pathway and the mitochondria-mediated intrinsic pathway . In the intrinsic pathway, apoptosis is initiated by Bax-dependent cytochrome c release from mitochondria, followed by apoptosome formation with cytochrome c, AMP, Apaf-1, and pro-caspase-9 . Caspase-9 activated within the apoptosome promotes caspase-3 activation leading to the apoptotic nuclear structure . This apoptotic response is tightly regulated by Bcl-2 to prevent the release of cytochrome c from mitochondria . Elimination of pathogen-infected cells is an important role of apoptosis as a primary defense against viruses and intracellular bacteria by precluding metabolic support for pathogen multiplication and engaging competent professional phagocytes for the action of immune defense mechanisms . Coping with defensive systems of host organisms as growth environments, intracellular bacteria, such as Shigella and Legionella, are thought to have developed a variety of strategies for modulating the apoptotic process in host cells, especially during early stages of the life cycle . Chlamydia pneumoniae is an obligatory intracellular bacterium that was first described in 1986 as a pathogen for acute respiratory diseases . It has also been implicated in the onset or progression of several chronic diseases including asthma , atherosclerosis  and Alzheimer’s disease . As a refined strategy to facilitate their survival and evade the host immunosurveillance, Chlamydia modulates host-cell pathways including apoptosis regulation. But the action of Chlamydia on host apoptosis has been successively reported with different outcomes from repression to promotion, mainly ascribed to the different conditions, different combinations of chlamydial species and host cell types, and different stages of infection . Chlamydia psittaci and Chlamydia trachomatis have been reported to induce apoptosis of cultured cells [13, 14, 15, 16], but C. trachomatis has also been shown to repress CD95-induced apoptosis . While C. pneumoniae was reported to inhibit apoptosis induced by staurosporine (STS) and tumor necrosis factor alpha (TNF-α) in infected epithelial cells, macrophages and monocytes [18, 19, 20, 21]. However, it was reported that C. pneumoniae induced apoptosis in coronary artery endothelial cells , whereas in many cases C. pneumoniae tends to suppress host apoptosis. Elucidation of host cell apoptosis controlled by Chlamydia is a prerequisite to understanding chlamydial strategies for persistent infection and how to overcome the diseases caused by Chlamydia. The involvements of many host and chlamydial factors have been described for inhibition of host apoptosis by Chlamydia species. The first installment reported that host cell apoptosis promoted by a variety of stimuli, such as STS and TNF-α, was inhibited by chlamydial infection. This inhibition was accompanied with and explained by prevention of the cytochrome c release from mitochondria [21, 23]. This prevention was later explained by specific degradation of the pro-apoptotic BH3-only proteins, such as Bik, Puma, Bim, Bad, Bmf, Noxa, and tBid [24, 25, 26]. Chlamydial protease, or proteasome-like activity factor (CPAF), which is a potent and promiscuous cysteine protease capable of cleaving many host proteins, was initially implicated in this degradation . However, subsequent studies showed that the proteolysis of the reported CPAF substrates was due to enzymatic activity in cell lysates rather than in intact cells [28, 29]. Moreover, conflicting observations concerning the degradation of the pro-apoptotic BH3-only proteins were also reported [30, 31]. Thus, the involvement of BH3-only proteins and CPAF is still an important topic to be clarified. Instead of the degradation of pro-apoptotic factors, stabilization of the anti-apoptotic factor Bcl-2 has been described [31, 32]. Along with protection from host cell apoptosis during C. trachomatis infection, the activation of both Raf/MEK/ERK (or MAPK/ERK) and PI3K/AKT pathways has been observed, leading to up regulation of mcl-1 gene expression and stabilization of Mcl-1, which binds to the BH3-only protein, Bim and inhibits apoptosis initiation . Recently, Bcl-2-associated athanogene (Bag-1), which interacts with a diverse array of molecular targets including anti-apoptotic regulator Bcl-2 and heat shock proteins, was identified as another element that is potentially regulated via the MAPK/ERK pathway . Two interesting sequestration models have been proposed, based on evidence suggesting that pro-apoptotic factors are mislocalized away from their conventional target sites in infected cells. In the first study, activation of the PI3K pathway by C. trachomatis infection, but not C. pneumoniae, led to phosphorylation of Bad, and the phosphorylated Bad was sequestered via 14-3-3 beta in the chlamydial inclusion membrane that expresses IncG proteins . The other observation was that protein kinase C delta (PKC-δ), which functions as a pro-apoptotic effector in the mitochondria and nucleus, was mislocalized in the immediate vicinity of chlamydial inclusions where diacylglycerol was accumulated . In both cases, it was not mentioned whether those factors work only to trigger apoptotic regulation or serve any other special functions at the sequestration sites. The engagement of downstream molecules has also been suggested. Chlamydia pneumoniae infection of human monocytic cells induced the expression of the cellular inhibitor of apoptosis 2 (cIAP2) by misuse of the NF-κB pathway during infection . Infection with C. trachomatis also led to the up regulation of cIAP2 and stabilized functional heterodimers of the IAPs, thereby the ability to inhibit apoptosis may be more secure . Herein we report that an epistatic effect of the apoptosome components apaf-1 and caspase-9 on chlamydial infection and its host apoptosis regulation; that is, caspase-9 functions as in the sequestration model of pro-apoptotic factors for the regulation of host apoptosis, and Apaf-1 restricts chlamydial infection. Interestingly, Chlamydia required caspase-9 activation for its infection, but this did not lead to caspase-3 activation or apoptotic events, and caspase-9 activation occured without Apaf-1. Our results suggest that the ratio of Apaf-1 and caspase-9 influences host susceptibility to chlamydial infection. Apoptosis inhibitors, Hoechst 33258, 4′-6-diamidino-2-phenylindole (DAPI), and cell-permeant inhibitors of Apaf-1 (NS3694), caspase-8 (Z-IETD-FMK), caspase-9 (Z-LEHD-FMK), and caspase-3 (Z-EDVD-FMK) were obtained from Sigma-Aldrich (Saint Louis, MO). Fetal calf serum was from Cansera International Inc. (Etobicoke, Canada). STS, gentamicin, penicillin, streptomycin, and cycloheximide were from Wako (Tokyo, Japan). Anti-Apaf-1, anti-caspase-9 and anti-caspase-3 antibodies were from Cell Signaling Technology (Danvers, MA). Anti-caspase-9 antibodies were also purchased from Calbiochem (La Jolla, CA) and Abcam (Cambridge, UK). Caspase-9, -8 and -3 Colorimetric Activity Assay kits, and ApopTag Fluorescein kit for TUNEL assays were from Chemicon (Temecula, CA). Chlamydiaceae-specific fluorescein isothiocyanate (FITC)-conjugated monoclonal antibody (Chlamydia-FA) was from Denka Seiken (Tokyo, Japan). Apaf-1 knockout (apaf-1 −/−) and caspase-9 knockout (caspase-9 −/−) mouse epithelial fibroblasts (MEF), and Bcl-2-overexpressing HeLa cells were kind gifts from Xiaodong Wang (Univ of Texas) , Shin Yonehara (Kyoto Univ)  and Yoshihide Tsujimoto (Osaka Univ) , respectively. These cell lines and their corresponding control cells, i.e., MEFs, HeLa229 (ATCC CCL-2), and HEp2 (ATCC CCL23) were cultured in Dulbecco’s modified Eagle’s medium supplemented with 2 mM l-glutamine (Sigma-Aldrich), 10 % heat-inactivated fetal calf serum and 50 µg/mL gentamicin at 37 °C under 5 % CO2. Chlamydia pneumoniae J138 and AR39, and C. trachomatis serovar D were used for chlamydial infection. Host cells, 2 × 104 cells per well of flat-bottomed 96-well tissue culture plates, were allowed to adhere for 24 h prior to infection. Measurements of infection rates for C. pneumoniae J138 were calculated by the same method described previously , or as described in the figure legend for each experiment. Briefly, the multiplicity of infection (MOI) of each chlamydial stock solution was first calculated and determined by its inclusion formation units (IFUs) against HEp-2 cells. Infection rates achieved at MOI = 0.2 in HEp-2, HeLa, and MEFs were approximately from 15 to 25 % in our experiments. Infection was generally carried out at MOI = 0.2 to given host cells. After cells were fixed at 48 h post-infection (hpi) and stained with Chlamydia-FA and DAPI, cells with inclusions only larger than 4 µm in diameter were counted as infected ones, to adjust the infectious stage and diminish staining noises. Infection rates were calculated based on cell numbers determined by DAPI staining of nuclei. Generally more than 100 infected cells were counted as a population for one sample. All data are expressed as mean ± SD calculated from at least three independent experiments. An asterisk denotes p < 0.05 with Student’s t test. Amounts of infectious progenies of C. pneumoniae were calculated as previously described . Briefly, culture supernatants of chlamydia infection at 80 hpi were harvested and used for re-infection in control MEFs. The infection rates were measured at 48 hpi. HEp-2 cells were infected with C. pneumonia J138 (MOI = 0.2). At certain times during infection, apoptosis of host cells was induced with 0.5 μM STS for 4 h. After fixation with 30 % and then 70 % ethanol for 10 min at room temperature, cells were stained with Chlamydia-FA and 2 µm Hoechst 33258 in phosphate-buffered saline (PBS) for 45 min at 4 °C. For the categorization of apoptotic or non-apoptotic cells in the infection cases, only cells containing inclusions larger than 4 µm in diameter were counted as the general population of infected cells. Cells with smaller inclusions or without any inclusions were eliminated from the cell counting. Out of more than 50 infected cells, which were selected randomly under 200 times magnification, cells showing apoptotic nuclear morphology were counted. All data are expressed as mean ± SD calculated from at least three independent experiments. An asterisk denotes p < 0.05 with Student’s t test. To confirm apoptotic cell death, we carried out TUNEL staining as described previously . For caspase-8, -3 and -9 activity assays, cytosolic extracts were prepared and analyzed by Colorimetric Activity Assay Kit (Chemicon), according to the manufacturer’s protocol. For western blot detection of Apaf-1, caspase-3 and -9 protein, total cell extracts were prepared from apaf-1 −/− and control MEFs in the lysis buffer of the caspase activity assay kit, and western blotting assays to detect caspase cleavage were performed as described previously . For analysis of the localization of caspase-9, host cells grown on coverglasses (with or without chlamydial infection) were fixed with 100 % methanol and independently stained with anti-caspase-9 antibodies purchased from Cell Signaling, Calbiochem and Abcam. To detect chlamydial inclusions, mouse anti-Chlamydia sp monoclonal antibody RR402 (Washington Research, Seattle, WA) and rhodamine-conjugated goat anti-mouse antibody (DAKO) were used. Polyclonal antibody against inclusion membrane protein A2 (IncA2) of C. pneumoniae J138 was produced using recombinant IncA2 protein by the same method as described previously . pCMV-SPORT6.1 containing the mouse apaf-1 gene was obtained from Invitrogen (Carlsbad, CA). The pCMV control vector was prepared by removing the 0.9-kb HindIII—HindIII region containing the mouse apaf-1 gene from the pCMV-SPORT6.1. Transfection was carried out with a Nucleofector (Lonza, Cologne, Germany) based on the manufacturer’s recommended methods. The infection assays were carried out when the rates of the transient transfection were above 70 %. We verified the involvement of C. pneumoniae J138 in HEp-2 cell apoptosis. Chlamydia pneumoniae-mediated blockage of STS-induced apoptosis was found at 48 hpi and this blockage ceased by 72 hpi (Fig. 1). Similar responses were observed using HeLa cells and MEFs (data not shown). In the absence of apoptotic stimuli, apoptotic induction by C. pneumoniae infection was not observed between 48 and 72 hpi, which are the middle and late stages of C. pneumoniae infection, respectively ; chlamydial infection partially stimulated STS-induced apoptosis at 72 hpi. These data, combined with previous results [18, 19, 20, 21], indicate that C. pneumoniae infection at relatively low MOI represses STS-induced apoptosis of various host cell lines in the early-to-middle stages of infection, but not in the late stage. The anti-apoptotic activity of chlamydial infection seems to be an advantage for escaping from the host immunosurveillance. It is also possible that this anti-apoptotic environment is also favorable for chlamydial multiplication. To verify this possibility, the susceptibility of host cells to chlamydial infection was assessed by adding anti-apoptotic agents prior to chlamydial infection (Fig. 2a). The cell-permeant irreversible caspase-9 inhibitor (C9-i) decreased the infection rate to nearly half of control, and cell-permeant Apaf-1 inhibitor (Ap-i) conduced a 1.5 times higher infection rate, while caspase-8 and -3 inhibitors (C8-i, C3-i, respectively) showed no modification of infection rates. It has been reported that C. trachomatis and C. psittaci induce host apoptosis and that chlamydial infection is inhibited by Bcl-2 overexpression . In contrast, no significant difference was observed in the current study in infection rates or inclusion sizes of C. pneumoniae J138 between the HeLa cells overexpressing Bcl-2 and control cells (Fig. 2b). To confirm the different contributions of Apaf-1 and caspase-9 in chlamydial infection, Apaf-1 and caspase-9 knockout (apaf-1 −/− and caspase-9 −/−, respectively) MEFs were used as host cells for infection. Consistent with the inhibitor treatment results, C. pneumoniae infection rates were four times greater in apaf-1 −/− MEFs than in controls, and reduced by nearly half in caspase-9 −/− MEFs (Fig. 3a). Generation of infectious progenies of C. pneumoniae was calculated using apaf-1 −/− MEFs. This result was consistent with the infection rate (Fig. 3b). Generation of infectious progenies from caspase-9 −/− MEFs was consistent with the infection rate as well (data not shown). Most of phenomena observed here using C. pneumoniae J138 were confirmed using C. pneumoniae AR39, and very similar data were achieved (data not shown). To test further species specificity, C. trachomatis was used for infection of apaf-1 −/− and caspase-9 −/− MEFs (Fig. 3c). Similar outcomes of infection were observed in both MEFs. In cells infected with both chlamydiae, no morphological changes of host nuclei between infected and non-infected cells were observed (Fig. 3d). To clarify whether or not caspase-9 functions independently from Apaf-1, and whether or not Apaf-1 is indeed a target of Ap-i, C9-i and other inhibitors were used during infection of apaf-1 −/− MEFs (Fig. 4a). In agreement with the HEp-2 data (Fig. 2), C9-i decreased but Ap-i increased the C. pneumoniae infection rates to MEF control cells (Fig. 4a, left panel). When apaf-1 −/− MEFs were treated with Ap-i, the incremental increase in the C. pneumoniae infection rate was negated; however, C9-i still decreased the infection rate (Fig. 4a, right panel). Complementation assays were performed using the apaf-1 gene and the apaf-1 −/− MEFs (Fig. 4b). The results showed that the incremental increase in infection rate was absent, but there was no further decline in the rate at the higher doses of the vector containing the apaf-1 gene. Caspase-9 is generally activated in apoptosomes that contain Apaf-1, but the C9-i used here, which is an antagonist of caspase-9 self-cleavage, inhibited chlamydial infection. Thus, it is possible that caspase-9 activation is required for chlamydial infection. We evaluated caspase-9 protease activity in host cell cytosolic fractions after infection of apaf-1 −/− MEFs (Fig. 5a). As expected, caspase-9 protease activity was increased in the control MEFs but not in apaf-1 −/− MEFs with STS treatment. In contrast, C. pneumoniae infection significantly increased caspase-9 protease activity in both of apaf-1 −/− and control MEFs (Fig. 5a). Generally, caspase-9 activation leads to activation of caspase-3 followed by apoptosis, but apoptosis was not observed after caspase-9 activation by chlamydial infection in apaf-1 −/− MEFs (Figs. 2a, 3d). Surprisingly, caspase-3 activity was not significantly increased by chlamydial infection at 48 hpi in the apaf-1 −/− and control MEFs, compared to STS treatment (Fig. 5b). Caspase-3 activity in the infected apaf-1 −/− MEFs was slightly higher than the background controls, which may be because activated caspase-9 activates caspase-3 when assay samples are prepared in vitro. Activation of caspase-3 and -9 was analyzed by western blot. Results were nearly consistent with the activity assays on apaf-1 −/− and control MEFs cytosolic fractions (Fig. 6). The higher levels of activated caspase-9 in the infected apaf-1 −/− MEFs compared to the infected control MEFs (approximately 5 times) is due to a higher infection rate in the apaf-1 −/− MEFs (Fig. 3a). These results indicate that there is a de novo mechanism for Apaf-1-independent caspase-9 activation during chlamydial infection and that the activated caspase-9 is not engaged in caspase-3 activation for host cell apoptosis. To address how caspase-3 is not activated by infection-induced activated caspase-9, we first analyzed expression of genes encoding inhibitors of apoptosis protein IAP1, IAP2, and XIAP. DNA microarray and quantitative RT-PCR at 48 hpi (data not shown) , showed that expression of these genes was not increased. However, caspase-9 was co-localized with chlamydial inclusions at 48 hpi by immunofluorescence staining using a caspase-9 antibody with apaf-1 −/− MEFs (Fig. 7) and all inclusions showed the presence of caspase-9. Two additional anti-caspase-9 antibodies purchased from different companies were tested and confirmed this result, and Caspase-9 was not detected in the caspase-9 −/− MEFs (data not shown). Moreover, comparing with localization of chlamydial inclusion membrane protein (IncA2), caspase-9 seemed to localize inside of inclusions. There data suggest the hypothesis that chlamydial infection-mediated repression of apoptosis is at least partially a result of caspase-9 sequestration in inclusions, in which caspase-9 is precluded from its role (or availability) in the host apoptosis cascade. Mechanisms for caspase-9 localization and activation remain as a challenge to comprehend chlamydial developmental cycle. Modifications of host cell apoptosis by chlamydial infection have been intensively studied. However, the roles of pro- or anti-apoptotic factors in chlamydial infections are not yet elucidated. In this study, we have attempted to clarify host apoptosis regulation by Chlamydia, mainly C. pneumoniae, using exogenous apoptosis repressors, such as bcl-2 overexpression, chemical apoptosis inhibitors, and gene knockout of apoptotic factors. Based on the results shown here, two hypotheses are proposed regarding an epistatic effect of apaf-1 and caspase-9 on chlamydial infection. First, both human and mouse cells treated with an apoptosome inhibitor and apaf-1 −/− MEFs are more susceptible to chlamydial infections than control cells. The apaf-1 gene could complement the susceptible phenotype. Beyond controversy, Apaf-1 is well-known to oligomerize and activate caspase-9 through a caspase recruitment domain (CARD). Nod1 and Nod2, which also contain the CARDs, were implicated as intracellular sensors that recognize patterns of intracellular pathogens [42, 43], while expression of both Nod1 and Nod2 in HEp-2 cells were not modified by chlamydial infection based on a DNA microarray analysis (data not shown). Thus, it is conceivable that the Apaf-1 functions as a host defense factor against invasion by intracellular pathogens as an inhibitor or sensor as well as a pro-apoptotic agent. In favor of this notion, a non-apoptotic role for Apaf-1 was recently proposed, in which it functions as a DNA damage regulator controlling the checkpoint kinase Chk1 and thus acts as a tumor suppressor . In this case, Apaf-1 may indirectly confine Chlamydia to supporting host cell proliferation; however we are proposing another direct response of Apaf-1 against chlamydial infection, as described below. In an opposite manner, human and mouse cells treated with a caspase-9 inhibitor and caspase-9 −/− MEFs are more insusceptible to chlamydial infections than control cells. Interestingly, caspase-9 was activated in Apaf-1 −/− MEFs by chlamydial infection, but the activated caspase-9 was disconnected from the caspase cascade that activates caspase-3. Moreover, activated caspase-9 was co-localized with chlamydial inclusions. Taken together, these data suggest that Chlamydia require caspase-9 activation for its inclusion maturation and/or multiplication. Therefore, we herein present another model for the repression of apoptosis by chlamydial infection. That is, caspase-9 sequestration by chlamydial infection from the host apoptosis cascade results in apoptosis repression of host cells, and Apaf-1 may compete against chlamydial utilization of caspase-9. This sequestration model is partially similar to those in which phosphorylated Bad was sequestered via 14-3-3 beta to the chlamydial inclusion membrane that contains IncG proteins  and a pro-apoptotic effector protein kinase C delta (PKC-δ) was mislocalized according to accumulation of diacylglycerol in the immediate vicinity of chlamydial inclusions . Chlamydia might develop this sequestration system to perturb multiple cellular processes of the host, such as rearrangement of the membrane trafficking system for its intracellular multiplication and inhibition of host cell apoptosis for persistent infection. Despite a well-known role of Apaf-1 in the activation of caspase-9 as the initiation of caspase cascade in a variety of cell models, several reports demonstrated that alternative mechanisms for caspase-9 activation exist independently of Apaf-1 on the basis of certain stimuli, such as the infection of Sendai virus in apaf-1 −/− MEFs  and UV irradiation in apaf-1 fog/fog cells . In Chlamydia cases, it is deemed that Chlamydia possesses a mechanism for Apaf-1-independent activation of caspase-9 supporting its multiplication in parallel with apoptosis repression by the caspase-9 sequestration. The hypotheses shown here may provide a valuable clue to investigate mechanisms for chlamydial infection causing varied diseases. We thank Cho-Chou Kuo (Washington Univ.) for critical comments, Yoshihide Tsujimoto and Yutaka Eguchi (Osaka Univ.) for providing Bcl-2 overexpressing HeLa cells, Shin Yonehara (Kyoto Univ.) for providing Caspase-9 knockout MEFs and Xiaodong Wang (Univ. of Texas Southwestern Medical Center) for providing Apaf-1 knockout MEFs. This study was supported by a Grant-in-Aid for Scientific Research and Knowledge Cluster Initiative from the Ministry of Education, Culture, Sports, Science and Technology of Japan (16012245, 16790255), and a research grant for Cardiovascular Diseases from the Ministry of Health, Labor and Welfare (Kou14-4).